1900 - New Jersey's population in the US Census of 1900 is reported as 1,883,669 people, the 16th highest of all states. Over one-fifth of babies die before reaching their first birthday. 1902 - On January 28, John F. Dryden, the founder and president of what became the Prudential Insurance Company of America, is elected by the state legislature as a Republican to the US Senate. He serves until 1907, when he withdraws as a candidate for re-election after some Republicans in the state Senate refuse to support him amid allegations that he offered money for votes in his first election and that he wished to continue in the Senate to exercise influence to oppose investigations of Prudential's business practices. - Professor Woodrow Wilson is named president of Princeton University. 1904 - The Great Train Robbery is filmed by Thomas Edison using locations near West Orange and along the Delaware and Lackawanna Railroad. The ten-minute film becomes the first movie to be widely shown in theaters and one of the most popular of the silent era. 1908: First route of Hudson and Manhattan rail tubes opens under the Hudson River. 1910- Woodrow Wilson, president of Princeton University, is nominated as Democratic candidate and elected as governor of New Jersey, defeating Republican candidate Vivian Lewis. Wilson is recruited to run by two leading Democratic bosses, Colonel George Harvey, editor of Harper's Weekly Magazine and former US Senator James Smith, Jr., but during the campaign Wilson calls for reforms to weaken the power of the political machines and their bosses. 1911 - As governor, Wilson turns on the Democratic bosses who had helped elect him, notably successfully opposing former US Senator Smith's candidacy to return to the Senate. He also proposes and obtains passage of legislation to require that primary elections be held to nominate party candidates rather than simply being appointed by the bosses; to increase penalties for bribery of government officials; to establish a state regulatory commission over utility rates; and to create a workers' compensation system for workplace injuries. - Doherty Silk Company builds state's first modernized textile mill in Clifton utilizing technology allowing workers to run multiple looms, an innovation which sparks labor protests over potential loss of jobs. 1912- The Titanic sinks on the night of April 14-15. Among the 1,513 lost are two close friends from Trenton who had traveled together in Europe: Stephen Weart Blackwell, eldest son of former New Jersey US Senator Jonathan H. Blackwell, and Washington Roebling II, founder of the Mercer Automobile Co. and only son of Charles Roebling, president of John A. Roebling Sons, and named after his uncle, Colonel Washington A. Roebling, who oversaw construction of the Brooklyn Bridge. - Governor Woodrow Wilson announces candidacy for Democratic presidential nomination, wins nomination on 46th ballot at Democratic National Convention in Baltimore on July 3, coming from behind to overtake the front-runner, House Speaker Champ Clark of Missouri. Wilson's nomination is secured after the Party's prior three-time presidential nominee, William Jennings Bryan, ends his neutrality and endorses Wilson. - After Wilson is nominated, over 100 Democratic congressmen, including House Speaker Champ Clark, Wilson's principal rival for the nomination, travel by train on July 20 to the Governor's summer residence at Sea Girt to meet the nominee and discuss the coming campaign. - In the November election, Wilson is elected with only 41.8% of the popular vote (but 435 of the 531 electoral votes) largely due to the split among the Republicans created by former Republican President Theodore Roosevelt running as the Progressive Party candidate when incumbent President William Howard Taft gains the Republican nomination. 1913 - Paterson "Silk Strike" begins in February and continues for six months in which 20,000 textile factory workers demand an eight-hour day and improved working conditions. The strike, which attracts national attention, ends in failure as factory owners resist changes they claim will make them uncompetitive with producers who utilize new technology allowing weavers to run multiple looms. - Louis "the Commodore" Kuehnle, a hotel owner and the boss of the Atlantic County Republican organization, is convicted of a conflict of interest in the award of an Atlantic City contract and is sentenced to one year of hard labor and a $1,000 fine. The conviction follows an unsuccessful prior prosecution launched by Governor Wilson's administration charging Kuehnle with election fraud after Atlantic County reported wide margins for Wilson's Republican opponent in the 1910 gubernatorial election. 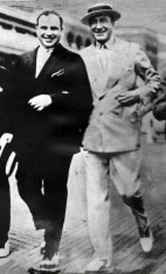 After his return from prison, Kuehnle loses a power struggle for control of the party organization to Enoch "Nucky" Johnson, who becomes the new boss, continuing until his own imprisonment in 1941. - President-elect Wilson resigns as governor on March 1 prior to his inauguration in Washington on March 4 as the 28th US president. - In his first term, President Wilson declares US intention to remain neutral during the war in Europe. He also successfully proposes and signs legislation strengthening banking regulation through the Federal Reserve Act; restricting anti-competitive and deceptive practices through the Federal Trade Commission Act; prohibiting monopolistic powers and price-fixing through the Clayton Antitrust Act; and expanding credit for farmers under the Federal Farm Loan Act. He also lowers tariffs by signing the Revenue Act of 1913 imposing an income tax to compensate for lost revenues and avoids a railroad strike by mandating an 8-hour workday for railroads under the authority of the Adamson Act. 1914 - First Lady Ellen Wilson dies in White House on August 6 of kidney failure resulting from Bright's Disease. - The American Marconi Wireless Corp. opens the New Brunswick Marconi Station, which is the site in the same year for the successful test of the regenerative circuit invented by Edwin Armstrong and developed by David Sarnoff to amplify radio signals. After the station is taken over by the US Navy in 1917, it becomes, along with its sister station in Belmar, the principal wartime communication link between the US and Europe. 1915 - In July, some 1,200 workers at the Standard Oil and Tidewater Petroleum refineries in Bayonne strike for better pay and working conditions, with a riot resulting in five deaths. The Bayonne police and private security guards are called in to stop the violence, and the superintendent of the Tidewater plant and 130 security guards are arrested for inciting a riot. The strike ends in two weeks after company management promises an eight-hour day and higher pay. - On December 18, President Wilson marries second wife, Edith Bolling Galt, a widow he had met nine months previously, with the wedding attended by forty guests at her home in Washington. 1916 - On July 30, a massive explosion destroys the munitions depot in Jersey City on Black Tom island near the Statue of Liberty, resulting in four deaths and causing damage to the statue and nearby structures on the mainland. 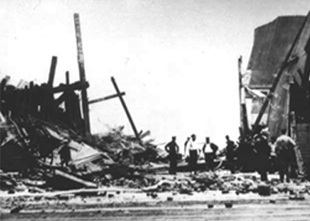 The depot had been used to ship munitions to the allied nations fighting Germany and the explosion is later alleged to have resulted from sabotage by agents working for Germany. The reaction to the explosion contributes to the enactment by Congress of the Espionage Act and Sedition Act. - President Wilson is re-elected to second term in November over Republican candidate Charles Evans Hughes, with some supporters using slogan "He kept us out of war." 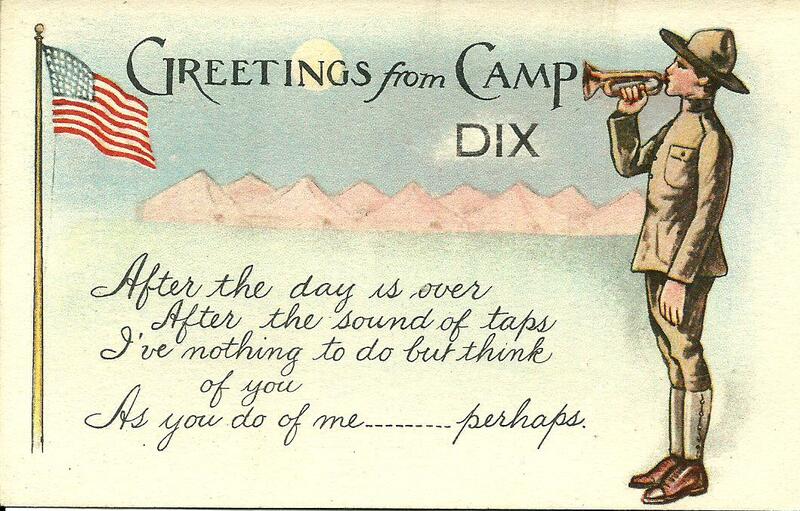 - New Jersey becomes a key center for mobilization, including establishment of Camp Dix as the principal training center for new troops and Camp Merritt for embarkation prior to transport to Europe. Some two million servicemen pass through Hoboken between the spring of 1917 and the fall of 1918 on their way to Europe, with General John "Black Jack" Pershing coining the slogan "Heaven, Hell, or Hoboken,” referring to the three potential fates facing his soldiers, nearly all of whom would come through Hoboken on their way home. On June 14, the first convoy of 14 ships carrying nearly 12,000 troops departs Hoboken for Europe. 1917 - After Germany rejects President Wilson's demands for protection of neutral shipping and institutes unrestricted submarine warfare, on April 2 Wilson asks for and receives a declaration of war by Congress against Germany. Of the three million troops who are sent to Europe, an estimated one million are processed through Camp Merritt in Bergen County and transported by ships from Hoboken. - Frank Hague is elected mayor of Jersey City, will continue in office until his retirement in 1947, also serves as Democratic National Committeeman from New Jersey from 1922 until 1949, and Vice-Chairman of the Democratic National Committee from 1924 until 1949. 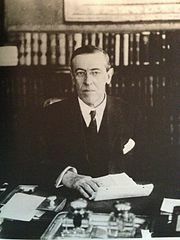 1918 - President Wilson proposes his "Fourteen Points" as principles to govern the post-War peace agreement, which include democratic votes to resolve issues of sovereignty; elimination of secret treaties and agreements; guarantees of free navigation; easing of tariff and trade barriers; and reduction of the levels of armaments. Most significantly, the final point proposes creation of "a general association of nations...for the purpose of affording mutual guarantees of political independence and territorial integrity to great and small states alike." - On June 2, called by some "Black Sunday," the U-151, the first German U-boat to operate in US waters in World War I, sinks six ships approximately sixty miles off the New Jersey coast, including the passenger liner SS Carolina. Only 13 are lost in the attacks, largely due to the German captain's allowing crew and passengers to evacuate the ships in lifeboats before sinking the vessels. - In the fall, a soldier at Fort Dix recently returned from Europe is the first person in New Jersey to be diagnosed with influenza as part of the global pandemic which by 1920 causes up to 50 million worldwide deaths and 675,000 in the US, according to some estimates. The disease quickly spreads across the state, particularly in confined quarters of military bases and in densely-populated urban neighborhoods. On October 10, with the total New Jersey cases approaching 100,000, the state Board of Health issues an order directing the closing of schools, theaters, taverns, churches and other gathering places. - The New Jersey College for Women opens to its first class of 54 students as part of Rutgers University, with funding support from the New Jersey State Federation of Women’s Clubs. Mabel Smith Douglass is named as its first dean, and in 1955 the school is renamed Douglass College in her honor. 1919 - After Germany agrees in November 1918 to an armistice ending hostilities, President Wilson travels to Europe to participate in months of negotiations in Paris, culminating in the signing of the Treaty of Versailles on June 28. While the treaty no longer includes most of Wilson’s Fourteen Points, it does incorporate his plan for creation of a League of Nations. During the course of the war, over 3,400 New Jersey military personnel were killed in action or otherwise died while in service. - Elizabeth Ann Blaesing is born in Asbury Park on October 22, the illegitimate daughter of Nan Britton and US Senator and future President Warren G. Harding, who at the time of the baby's birth is about to launch his successful 1920 presidential campaign to succeed Wilson. Harding had secured living arrangements for his mistress at a house in Asbury Park after she had become pregnant during their affair. In August 2015, the paternity of Britton's baby by Harding is confirmed through DNA testing. - Upon returning to the US from Paris, President Wilson launches a wide-ranging speaking campaign to gain public support for the treaty and its creation of the League. He suffers severe headaches and asthma attacks after delivering a speech in Colorado, and is rushed back to the White House, where on October 2 he has a stroke leaving him partially paralyzed. His condition is kept hidden from the Congress and the public by his wife Edith, along with his doctor; during his months of convalescence, Edith restricts access to her husband and reportedly makes decisions in his name. - In November, the Treaty of Versailles fails to obtain the two-thirds Senate majority required for ratification. - In the gubernatorial election, the principal issue is Prohibition, with the New Jersey contest becoming known as the "The Applejack Campaign" (an alcoholic drink made from hard cider, often produced in New Jersey). Although the 18th Amendment to the US Constitution already had been ratified, there were questions on the extent which New Jersey and other states would enforce it when it went into effect in 1920. Democratic candidate Edward I. Edwards was strongly anti-Prohibition, proclaiming himself "as wet as the Atlantic Ocean," with his Republican opponent Newton Bugbee arguing that it would be irresponsible not to enforce the federal mandate. Edwards defeats Bugbee by a 49%-46% margin, as urban residents and immigrant groups shifted to the Democratic Party as a result of the Prohibition issue. ​1920 - Prohibition goes into effect throughout the nation at midnight on January 16, but with little enforcement within the state headed by Governor Edward Edwards, who during his campaign had pledged to make the state “as wet as the Atlantic Ocean.” Atlantic City and its surrounding region also becomes a leading national center for receiving bootleg illegal alcohol from boats along the coast, with the system overseen by Nucky Johnson, the County's powerful Republican boss who reportedly collects fees for shipments and kickbacks from taverns and hotels who openly serve alcohol. - On August 18, the Nineteenth Amendment to the US Constitution is ratified giving women the right to vote. President Wilson initially had opposed the federal amendment, stating that he preferred leaving the issue of voting to action by each state, but in the face of growing protests and the contributions of women in supporting the war effort, he later reversed his position to endorse the amendment. - Ohio Republican Senator Warren Harding wins 37 states and 60% of the popular votes in the presidential election, defeating a fellow Ohioan, the state's Democratic Governor James Cox. Harding's "Return to Normalcy" slogan stresses a refocus to domestic concerns, taking advantage of the public backlash against the international and idealist policies of Wilson. 1921 - The Port of New York Authority is created following authorizing legislation enacted by New Jersey and New York and the approval of the interstate compact by the Congress. The bi-state agreement is intended to improve management and coordination of the system of bridges, highways, subways, and port facilities, which had led to congestion during the port's service in World War I as the principal point supporting the war effort. - Johnson & Johnson begins marketing of its BAND-AID® bandages, invented by employee Earle Dickson in 1920, the first commercial dressings for small wounds that consumers can apply themselves. 1922 - WOR radio begins broadcasting on February 22 from Bamberger's department store in Newark, with store owner Louis Bamberger pursuing his personal interest in the new technology and also seeking to promote sales of radio sets. The broadcast continues until 1924, when the station moves to a studio in Manhattan. - Campbell Soup Co. incorporated in Camden. 1924 - Former President Wilson dies on February 3 at his home in Washington, DC, and is interred at Washington’s National Cathedral. 1926 - The Benjamin Franklin Bridge connecting Philadelphia and Camden is opened to traffic on July 1, three days ahead of the 150th anniversary of the Declaration of Independence. 1927 - The Holland Tunnel, named after the project's chief engineer Clifford Milburn Holland, opens to traffic connecting Jersey City with Lower Manhattan as the first underwater tunnel mechanically ventilated to evacuate carbon monoxide which would otherwise be fatal to motorists. Built at a cost of $48 million by separate commissions created by New York and New Jersey, its operation is transferred in 1930 to the Port of New York Authority. 1928 - Newark Airport opens on October 1 on 68 acres of reclaimed wetlands along the Passaic River on the boundary of Newark and Elizabeth. It is the first major airport serving passengers in the New York metropolitan area; the first in the world with a paved runway; and becomes the busiest commercial airport in the world until LaGuardia Airport opens in December 1939. - The first drive-in movie theater opens in Camden on June 6. The concept was developed by Richard Hollingshead, the sales manager at his father’s local company, Whiz Auto Products, who was motivated by his mother's difficulty in being comfortable in traditional theater seats. He obtains a patent for the idea in 1933, which is overturned in 1949, followed by the rapid expansion of drive-ins throughout the country in the 1950s. - On July 12, Captain Emilio Carranza, a Mexican aviator known as the "Lindbergh of Mexico," is killed when his plane crashes in forests in the Pinelands on his flight from New York City to Mexico City. 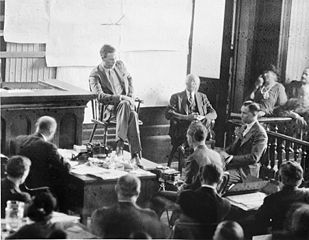 1929 - The "Atlantic City Conference" hosted by Enoch "Nucky" Johnson begins on May 13 for three days of talks among the nation's top mobsters. The participants include Al Capone, Lucky Luciano, Meyer Lansky, Bugsy Siegel, Dutch Schultz, Abner "Longy" Zwillman and others. It reportedly discusses avoiding the publicity generated by the "St. Valentine's Day Massacre" in Chicago directed by Capone earlier in the year; reducing competition among the mobs; and planning to compensate for lost revenues from the expected repeal of Prohibition by expanding their roles in illegal gambling and prostitution. - The "Diving Horse" attraction begins on Atlantic City's Steel Pier, with a horse and rider diving some forty feet into a tank of water filled to a 12-foot depth. The attraction continues until the Pier is closed in 1978. - The October 29 stock market collapse is followed by the Great Depression of the 1930s. In New Jersey, per capita income falls from $839 in 1929 to $433 in 1933 and some 140 banks close between 1928 and 1933. 1930 - The Institute for Advanced Study is founded in Princeton as a center for theoretical research by leading scholars with financial support from Newark retailer Louis Bamberger and his sister Caroline Bamberger Fuld. A primary goal of the Institute is to provide a haven for Jewish scientists fleeing the Nazis in Europe, and in 1933 Albert Einstein emigrates to join the permanent faculty, remaining until his death in 1955. 1931 - The George Washington Bridge is opened for traffic in October after its construction at a cost of $60 million by the Port Authority of New York. The Bridge is completed ahead of schedule and under the estimated cost of $75 million. - Thomas Edison dies on October 18 at age of 84 at his home of Glenmont in West Orange. His family holds a public viewing at his West Orange laboratory, which lasts two days and attracts thousands of visitors. President Hoover suggests that in tribute to Edison all citizens dim their lights for one minute at 7 p.m. on October 21. 1932 - On March 1, Charles A. Lindbergh, Jr., the 20-month old son of Anne and Charles Lindbergh Sr., is kidnapped from the second-floor bedroom of the Lindbergh home in East Amwell. After an extensive search in which the senior Lindbergh and Herman Norman Schwarzkopf, the superintendent of the New Jersey State Police, took leading personal roles, the child's body is found in woods in Hopewell Township about 4.5 miles south of the Lindbergh home, with his death attributed to a skull fracture. - Franklin D. Roosevelt is nominated at the Democratic National Convention as the party's presidential candidate. Jersey City Mayor Frank Hague, who had initially supported New York Governor Alfred Smith for the nomination and had served as vice chairman of the Democratic National Committee since 1924, demonstrates his political strength by organizing a campaign kick-off rally on August 27 for Roosevelt at the National Guard training center in Sea Girt with over 100,000 supporters, many arriving by chartered trains and buses from North Jersey. 1934 - The passenger liner Morro Castle, sailing to New York City from Havana, catches fire on September 8 off the New Jersey coast, resulting in 137 deaths of passengers and crew, with the ship later coming aground off the Convention Hall in Asbury Park, attracting thousands to view the ship as she remained there for several months before being towed away and scrapped. 1935 - President Roosevelt creates the Works Progress Administration by executive order on May 6 to provide funds for projects to produce jobs. In New Jersey, Jersey City Mayor Hague becomes the key conduit for approval, with WPA funds supporting construction of the Jersey City Medical Center, Margaret Hague Maternity Hospital and Roosevelt Stadium in the City, as well as projects in other parts of the state including the expansion of Fort Dix, development of Roosevelt Park in Edison and Rutgers Stadium in Piscataway. 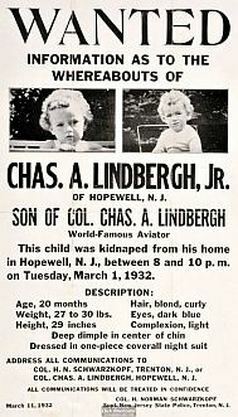 - Bruno Richard Hauptmann, a German immigrant who lived in the Bronx, is convicted on February 13 for the kidnapping and murder of the Lindbergh baby after a highly-publicized trial at the Hunterdon County Court House in Flemington and sentenced to death by execution. The case is prosecuted by New Jersey Attorney General David Wilentz. - Bruce Wright, a son of bi-racial parents, is awarded a scholarship to Princeton University but after arriving on campus and his race is discovered, is denied admission by University officials, who later advise him in a letter that their action was due to the school having "no colored students" and that "a member of your race might feel very much alone." Wright later becomes a prominent New York State judge and author known for his criticism of racism in the setting of bail and other steps in the judicial process, and some 65 years after his exclusion returns to Princeton when its graduating class of 2001 names him as an honorary member of the class. 1936 - After an appeal of his conviction to the US Supreme Court is denied and the expiration of temporary stays of execution granted by Governor Harold Hoffman, Bruno Richard Hauptmann is executed at 8:47 p.m. on April 3 in the electric chair at Trenton State Prison for the kidnapping and murder of Charles A. Lindbergh, Jr.
1937 - The German airship Hindenburg is consumed by fire as it hovers to land on May 6 at the Lakehurst Naval Air Station in Ocean County. Thirty-six passengers and crew die in the disaster, whose cause is generally thought to have been static electricity caused by atmospheric conditions and a spark igniting a hydrogen leak from the ship. 1938 - On October 30, director and actor Orson Welles broadcasts the radio play War of the Worlds describing a landing of Martians in Grovers Mill in West Windsor, which produces panic among those believing it is an account of a real event. - US Army's first radio-based aircraft detection and ranging system (later called radar) is developed by the Army Signal Corps at Fort Monmouth. 1939 - Albert Einstein writes letter to President Roosevelt dated August 2 advising him of research by Leo Szilard and others which could lead to development of an atomic bomb, as well as evidence that Germany may also be engaged in similar research. The letter is widely attributed as a major factor in leading to the launch of the Manhattan Project to build the bomb. 1940 - On August 23, Jersey City Mayor Frank Hague organizes a rally in Sea Girt, with a crowd estimated at over 150,000 to launch the successful Democratic gubernatorial campaign of Charles Edison. Edison is the son of Thomas Edison and a president of his father's company until becoming US Navy Secretary in the Roosevelt Administration, a post he resigned in June to run for governor with Roosevelt's support. - A series of explosions on September 12 at the Hercules Powder Co. in Roxbury Township in Morris County kills 51 workers and injures over 200, many with severe burns. Despite suspicions that the blasts may have been set by German agents, the cause is never conclusively determined. 1941 - Shortly after his inauguration in January, Governor Edison feuds with Jersey City Mayor Frank Hague over judicial appointments and his support of relief to railroads for back taxes owed to Jersey City and other municipalities where they operated. - Japan attacks Pearl Harbor on December 7, with Congress granting President Roosevelt's request on the following day for a declaration of war. By the war's end in 1945, there are 10,372 reported deaths from combat, accidents or illness of those in military service from New Jersey. 1942 - As in World War I, New Jersey becomes a major center for war mobilization. Some 560,200 men and women serve in the armed forces and military installations in the state, primarily Fort Dix and Camp Kilmer, process three million soldiers. 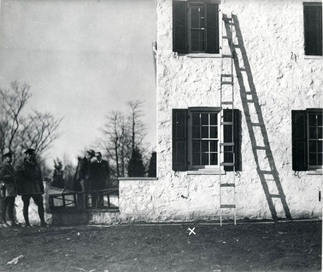 The Army Signal Corps at Fort Monmouth trains 21,000 communications officers, and in addition to radar, develops the first backpack FM radio, which is widely employed for battlefield communications. Employment in the state doubles from 1939 to 1945, and over 8,000 ships are built, expanded or repaired in Hoboken, led by the Bethlehem Steel and Todd Shipyards. 1943 - Battleship USS New Jersey is commissioned on May 23 after construction at the Philadelphia Shipyard. 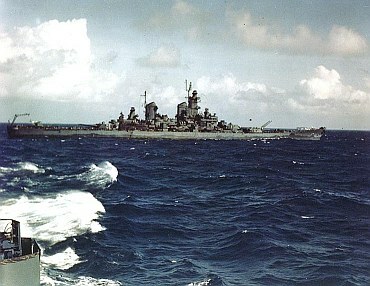 One of the class of battleships promoted by Charles Edison while he served as Assistant Secretary and then US Navy Secretary in the Roosevelt Administration prior to resigning in June 1940 to run for governor, the ship sees extensive action in the Pacific, including support of the assaults on Guam, Iwo Jima and Okinawa and as the flagship of Admiral William F. Halsey, Jr.
- In the November election, Republican Walter Edge of Atlantic County, who served as governor during World War I, is again elected, thus serving as the state's chief executive during both world wars. 1944 - A hurricane with winds recorded at the Manasquan Coast Guard station of 90 miles an hour causes extensive damage along the Atlantic Coast, including destroying the Heinz Pier and heavily damaging the Steel Pier in Atlantic City; cutting off the causeway connecting Long Beach Island with the mainland; tearing up boardwalks in Belmar, Ocean Grove, Asbury Park and Long Branch; and destroying or flooding many beachfront homes. 1945 - On May 7, German commanders sign surrender documents ending the war in Europe and order cease in hostilities by all forces. On May 14 just off Cape May, the German submarine U-858 surrenders to a task-group from the US Atlantic Fleet. - On September 2, after atomic bombs are dropped on Hiroshima and Nagasaki, World War II ends with signing of Japanese surrender on Battleship USS Missouri in Tokyo Bay. The Missouri is selected to host the ceremony to honor President Truman's native state, although some suggest the New Jersey should have been chosen to recognize its more extensive combat service during the War. - Legislation is enacted designating Rutgers as the state university. 1947 - In September, enrollment at Rutgers soars to 4,200 compared to 750 in September 1945, largely due to the expansion of classes to accommodate returning World War II veterans. - At the November election, voters ratify adoption of a new state constitution to replace the Constitution of 1844. The constitution was drafted by delegates elected to a convention convened at Rutgers University on June 12 which continued to September 10. The principal changes of the new constitution include strengthening the role of the governor; consolidating state agencies under the governor's control; and restructuring the judiciary under the new Supreme Court. Governor Alfred Driscoll and prominent attorney, legal educator and Essex County Republican leader Arthur Vanderbilt are key advocates for adoption of the new Constitution. 1948 - In September, Governor Driscoll nominates Arthur Vanderbilt as chief justice of the new state Supreme Court established pursuant to the 1947 Constitution.